February 1, 2016 – An advocate of the strenuous life, President Theodore Roosevelt saw sports as essential to developing physical fitness and character. So when 18 players died playing football in 1905, and people called to ban the game, TR leaped into action to reform the pigskin pastime. The game in those days resembled rugby much more than the game the Denver Broncos and Carolina Panthers will play in Super Bowl 50. Joining us to discuss how we got from a time no forward pass, neutral zone or pads to the present day, is John J. Miller. 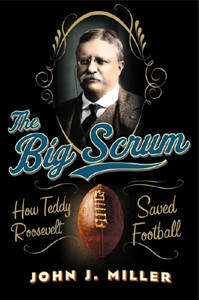 His book is titled, The Big Scrum: How Teddy Roosevelt Saved Football . John J. Miller is a correspondent for National Review, contributor to the Wall Street Journal, and author of four books including a novel, The First Assassin , and the non-fiction offering: Our Oldest Enemy — A history of America’s Disastrous Relationship with France . He’s also director of the Dow Journalism Program at Hillsdale College — and a proud fan of his college team, the Michigan University Wolverines. You can follow him on Twitter @HeyMiller, like him at Facebook.com/HeyMiller, or visit him at HeyMiller.com. He also hosts a podcast you’ll want to check out if you’re listening here. The show is called The Bookmonger with John J. Miller.